For full technical specifications click here. With URL scheduling and full screen YouTube video playback, EasyWorship 2009 helps you connect your audience to the web. Use the online feature to show your church’s new website or latest YouTube video. 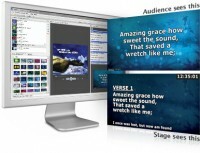 EasyWorship 2009 also provides access to the online media store, which includes integrated downloads so media is automatically placed in the correct library in EasyWorship. Your audience is first, but your stage needs support, too. While the audience sees the presentation on the main display, Display Foldback lets the stage see a custom display with the current presentation, a preview of the next scheduled item, a clock and private alerts. Customise the way the stage sees PowerPoint presentations with variable thumbnails for previous, current and next slide. This is the perfect place for planned spontaneity. In Video Jockey Mode, switching backgrounds during a live song or scripture takes one click. The option to view your media library in the Live Area makes it easy to fade between backgrounds on the fly while keeping up with song lyrics or scripture changes. Import and organise your audio files for scheduled playback during a presentation, or assign a single audio file to multiple lyric or scripture slides. EasyWorship’s new media player displays total and elapsed time with controls for volume, mute, play/pause, repeat and seek. Now theme-aware for XP, Vista and Windows 7, EasyWorship 2009 introduces updated buttons and icons throughout, modernised look and feel, general layout improvements and updated interface controls for video, DVD and feeds. The online media store gives you access to a vast array of stills, motions, movies and countdowns. All professionally developed, allowing you to add extra quality to your presentations.